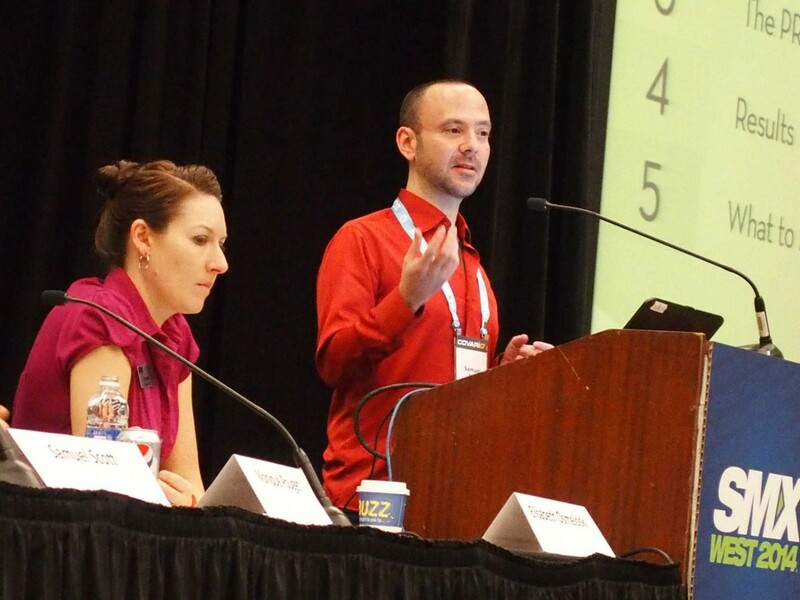 SAN JOSE, California – I had the honor of speaking at Search Marketing Expo (SMX) West last week on the topic of how digital marketers can use traditional public-relations strategies to build brands, earn links, and get media coverage. The topic is important because the age of “building” links for SEO – spinning articles, submitting to generic directories, and so on – is rapidly approaching its demise. (And thankfully so!) Although Google considers a link to a website to be a “vote” for its quality and authoritativeness, not all links are created equal. One link from a random directory means little. One link from The New York Times means a lot. As a result, inbound and online-marketing campaigns need to incorporate PR strategies in addition to SEO, social media, and content marketing ones. However, too many SEOs still believe that press releases are merely ways to get links (usually by stuffing them with anchor-text keyword links and distributing them throughout the Internet). So, my goal in speaking was to tell my fellow online marketers that the point of press releases is to get coverage – that indirectly leads to quality links later – and then show them the strategic PR process. The notes for each slide of my presentation are below. I’m a former journalist and newspaper editor who moved into digital marketing after newspapers started to die. The key to success is first to identify your business and marketing goals. Then, based on the objectives, you need to create an overall strategy that combines the tactics that will comprise the marketing mix. Whenever you want to do any type of marketing, you need to do it in a strategic way. Here, I’ll give an example of how SEO and PR can be integrated. First, do something newsworthy. Then, create shareable content based on what you’ve done. Then, use traditional PR to promote the company and online PR and social media to promote the content. As a result of attracting relevant traffic to your website, you will gain customers, leads, links, more social-media followers, and so on. Repeat this process as much as possible – every day, every week, every month, every quarter, and every year. The first step is the hardest and most-often overlooked. Marketing cannot occur in a vacuum – marketing needs to promote something newsworthy and/or valuable. This is where you need to be creative. What can you do to make you stand out from the competitors in your industry? When I was a journalist, I once caught the Boston’s city government doing something wrong. All I wanted to hear was a simple, “Yes, we made a mistake, and we’re going to fix it.” But of course, they would spin and BS even though it was obvious that I was right. So, that was always my impression of PR. But I was wrong. What I had experienced was media relations – which is just one type of PR. Other types are crisis communications, government relations, community relations, analyst relations, and countless others. Any interaction with human beings is usually PR by another name. These are example of communications channels that can be used to do PR. They are not disciplines unto themselves – and that includes social media. “SEO” is actually a slang term for a collection of best practices. It is doing web development well, content well, social media well, conversion optimization well, and so on. It also needs to include doing PR well. Say that you are interacting with influencers on Twitter. You can call yourself a “social-media marketer,” but you’re really just doing PR via the specific communications channel of social media. And today, online marketers need to know PR best practices because PR professionals know how to interact with people effectively. Technologies and communication channels change, but people do not. I use the following PR process for our clients. This strategic process can work for you as well. PR is not about “getting coverage” – it is a means to the end of getting coverage that supports a company’s overall goals. Here are some examples from our clients. Once you know your goals, then you need to choose the audiences that will best help you to achieve those goals. “Positioning” is how a company chooses to brand itself. “Messaging” is how a company uses text, pictures, and more to communicate the positioning. Here’s one example from a mobile-app client, MediSafe. Which of the following pitches do you think is more effective? The second example is the opening paragraph of a Cult of Mac article. We successfully positioned MediSafe as a personal story rather than as just another random app. Position and pitch a story, not a product. Create a list of outlets read by your target audience and the most appropriate writers at those publications. Target pitches to the right people at the right outlets. Never create press releases to get links. The goal here is to get coverage. Here is a guide to using Twitter for media relations. One of these links from an authoritative outlet is better than a thousand links from random directories. The best way to build your brand both online and offline has been, is, and always will be PR. I wanted to thank SMX as well as my panel’s moderator, Elisabeth Osmeloski, and the other two speakers, Monique Pouget and Kaila Strong. I had a wonderful first trip to Silicon Valley, and I personally learned a lot from the three of them. And I’m sure the audience did too!